In the heart of historic downtown Monterey, surrounded by the attractions of the spectacular Monterey Peninsula, the Monterey Marriott provides an ideal location and the best views of the Monterey Bay coastline. Fully renovated and including the new Revive bedding and bath collections. Complimentary Business Center with high speed Internet access, heated pool, whirlpool, and on-site Fitness Center featuring LCD screens on all cardio equipment. 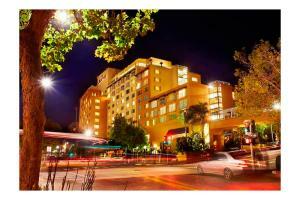 Located in downtown Monterey, approximately 70 miles from San Jose and 100 miles from San Francisco. This hotel has two restuarants and a coffee bar.